Constructional difficulty: 1U version, moderate. 3U version, complex. This is the 1U wide 'Filter Core' version of the Transistor Superladder. 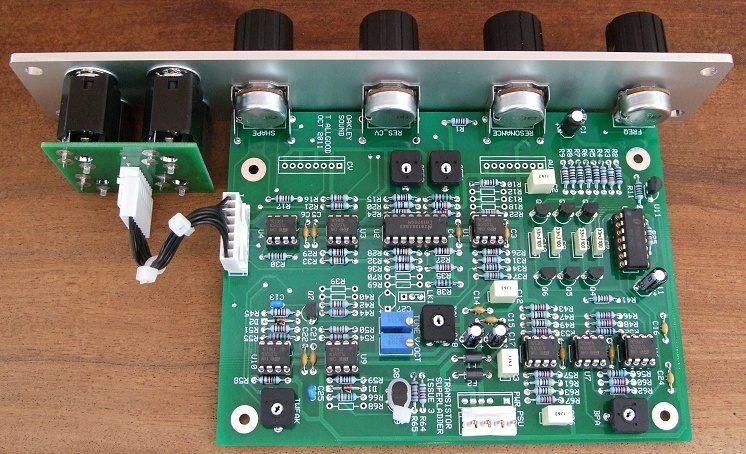 One would use this module in conjunction with external mixers for maximum control. The Transistor Superladder or TSL is a voltage controlled transistor ladder filter. Cut-off frequency and resonance are both voltage controllable. The Superladder VCF module has a variable shape output. It incorporates a feature first seen on the Oakley Orbital prototypes. A single pot allows you to vary the output from one pole low pass to four pole low pass via band pass in the middle. The Superladder's output is what we call 'Q compensated'. 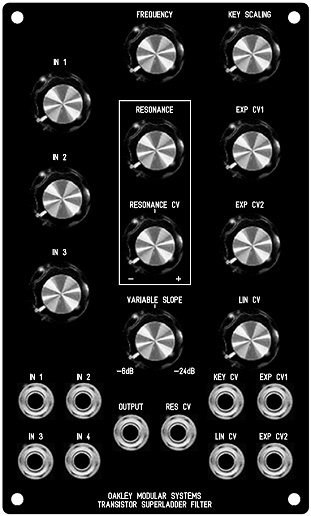 This means that the output volume will not drop significantly when you turn up the resonance pot. This design uses two inbuilt VCAs to achieve voltage controlled resonance without the hassle. At high levels of resonance the Superladder will self-oscillate across most of the audio band and thus can be used as a sinewave voltage controlled oscillator. The module design uses a discrete transistor core which means it does not clip the signal abruptly but saturates smoothly. This allows the Superladder to sound very different depending on the input signal level. When used with signals below 1.5V peak the Superladder will sound clean and bright. However, take your signal levels above 1.5V peak and it will start to take on a more strident tone particularly at higher levels of resonance. Coupled with the variable slope control, this sensitivity to input level means the Superladder can produce a wonderful array of different tones. Also available from Oakley Sound is the Diode Superladder. This is similar in function to the Transistor Superladder but uses diodes instead of transistors in the filter core, and sounds considerably different. This is the 3U version of the Superladder. This is a fully featured filter module that includes inbuilt CV and audio mixer sections. Simple sequence with two Oakley VCOs at one octave spread on sawtooth outputs. The filter is manually being swept via the 'shape', 'freq', 'resonance' pots and altering ADSR sweep depth. A different simple sequence being played using an Oakley VC-LFO as the single audio source. Again the filter is being altered by manually controlling the front panel pots. Some reverb and echo is being used to add ambience. The above photo shows the older issue 3 TSL PCB fitted to the 1U wide MOTM compatible panel in Scheaffer's natural finish. Note also the use of the optional Sock4 socket board to help keep the wiring to the sockets neat and tidy. The PCB is 102 mm (deep) x 143 mm (height). The frequency, resonance, resonance CV depth and shape pots can be board mounted for easier construction. Ready made Superladder modules in MOTM format are normally available from Krisp1.com. Last revised: March 01, 2019.